I took a couple of weeks off to spend time with the family, first camping and then renting a cottage in Muskoka. 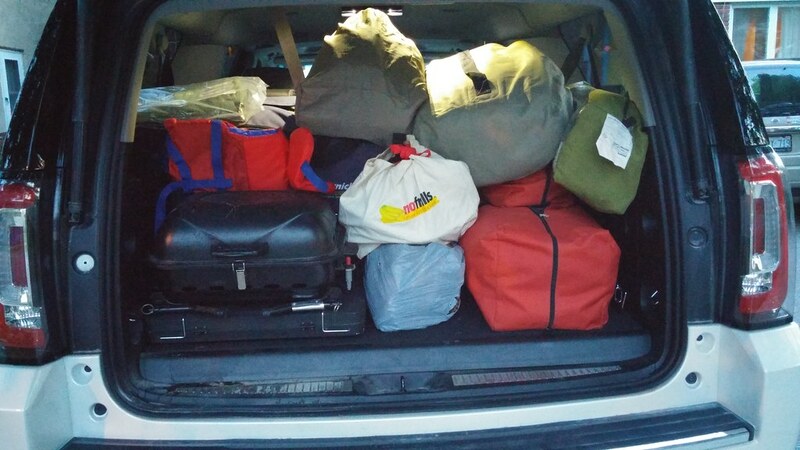 There are five of us, two tents, a cooler, several sleeping bags, a BBQ and, well, everything else. To borrow a line from Martin Brody, we're going to need a bigger car. GM Canada came through with a bigger car. Except it's not just big, it's absolutely humongous. 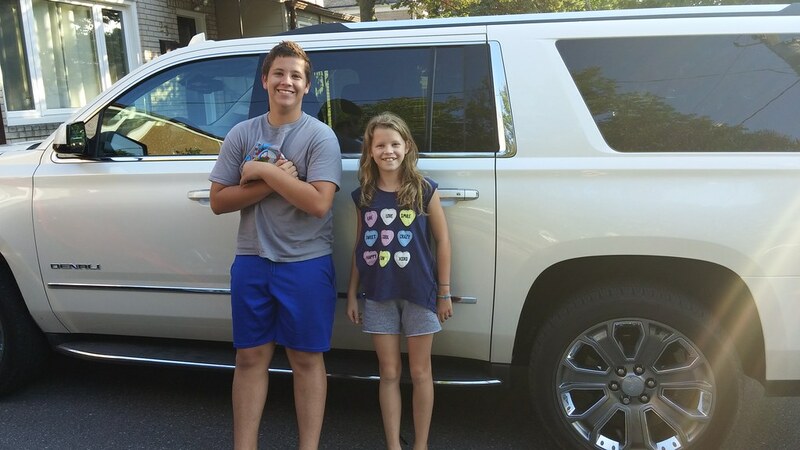 The GMC Yukon XL has seats for nine and a mind-boggling amount of space in the trunk. Here's the little guy for scale. I had come from a Mazda Protege, so it took me a little time to adapt to my new size, but in no time I forgot I was driving a small bus. It was a quiet, smooth ride to Sandbanks, and its 5.3L V8 EcoTec3 engine was a welcome change. Dammit Mike! You proudly drive this gas-guzzler while single-handedly contributing to global warming??? Think of our children's future! Does anyone really need a vehicle that size? 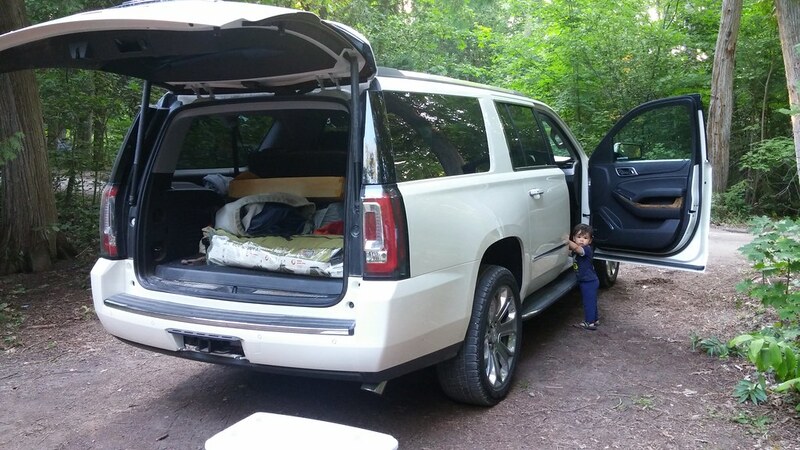 Large families or smaller families with mega cargo. These and Escalades are the standard vehicle used by the soccer moms out here in Oakville. We never subscribed, our 1999 Honda CRV worked for us. Since I drive a Prius, how was the gas mileage between this and the Explorer? Let's see... this has a 100 litre tank, whereas the Explorer has a 70 litre tank. I drove 472 km to Sandbanks and back with the Yukon, all on a single tank of gas. I think I had almost a quarter of a tank left when I got home. I drove 516 km to White Birches Cottages and back with the Explorer, and was probably half way home when I stopped for gas. According to the specs, the Explorer is better on gas than the Yukon, but the Yukon has more cargo space and more power. Jeez your kids have become so big!